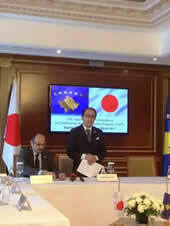 Relations between Japan and Kosovo are growing, helped by our active international cooperation. 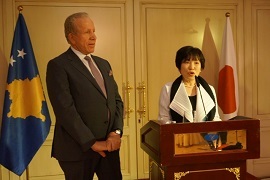 On the occasion of the 10th anniversary of the establishment of diplomatic relations between Kosovo and Japan, Dr. Toshiko Abe, State Minister for Foreign Affairs, paid an official visit to the Republic of Kosovo. On February 21, she held bilateral meetings with President Hashim Thaci, Prime Minister Ramush Haradinaj as well as First Deputy Prime Minister and Foreign Minister Behgjet Pacolli. After the meeting with Mr. Pacolli, both parties exchanged notes on the Japanese Grant Aid (Economic and Social Development Programme) amounting to a total of approx. 2 million euro (250 million yen). The grant aid will be used for providing Kosovar municipalities with waste collection vehicles produced in Japan. This cooperation is expected to improve the living environment of Kosovar citizens by enhancing the waste collection rate, thus contributing to the economic and social development as well as the stability of the country. Furthermore, Dr. Abe attended a planting ceremony of 30 cherry blossom trees, visited a Japanese company active in Kosovo, and hosted the reception celebrating the 10th anniversary of diplomatic relations between Kosovo and Japan. Ambassador Koinuma visited Kosovo from September 24 to 26. 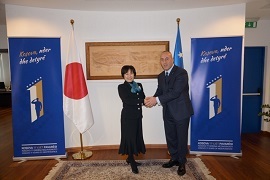 During his stay in Prishtina, he had a meeting with Mr. Kadri Veseli, President of the Kosovo Assembly, and several ministers of the Government of Kosovo, during which they discussed their intent to strengthen bilateral relations on the occasion of the 10th anniversary of diplomatic relationship between Kosovo and Japan in 2019. Ambassador Koinuma also visited the primary and junior high school “Faik Konica” in Prishtina and received a warm welcome by the school’s director, teachers and pupils. Japan supported the renovation of the school facilities through the Grant Assistance Grassroots Human Security Project scheme. Ambassador Koinuma visited Kosovo from March 19 to 21. On the 19th, he held a speech at the opening ceremony of the Japanese film festival at the National Theatre of Kosovo. On March 20th, the signing ceremony of the seven contracts for the 2017 Grant Assistance Grassroots Human Security Project and Grant Assistance Cultural Grassroots Project was held. On March 21st, Ambassador Koinuma met with Mr. Shpend Ahmeti, Mayor of Pristina. On February 18, Mr. Manabu HORII, Parliamentary Vice-Minister for Foreign Affairs, paid an official visit to Kosovo, and as representative of the Government of Japan attended the state ceremony and reception celebrating the 10th anniversary of the Republic of Kosovo gaining independence. He also held bilateral meetings with President Hashim Thaci as well as First Deputy Prime Minister and Foreign Minister Behgjet Pacolli. At the meeting with Mr. Pacolli, both parties exchanged notes on the Japanese Grant Aid (Economic Development Plan) amounting to a total of approx. 1.2 million euro (150 million yen). 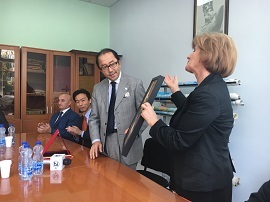 The grant aid will be used for providing the University Clinical Center in Prishtina, a core medical facility in the country, with medical equipment produced in Japan. The aid is expected to improve the medical services provided by the Clinical Center which carries out more than 20,000 surgeries every year, and allow the population of the Republic of Kosovo to receive improved medical services. This grant actualizes the declaration made by Prime Minister Shinzo Abe in January 2018, announcing Japan’s commitment to assist economic and social reforms in the six countries of the Western Balkans region including the Republic of Kosovo within the framework of the “Western Balkans Cooperation Initiative”. Ambassador Kiyoshi Koinuma payed an official visit to Kosovo from November 20 to 22 in his function as Ambassador of Japan to Kosovo. He had a full agenda of meetings in Pristina that included bilateral talks with Prime Minister Ramush Haradinaj, First Deputy Prime Minister and Foreign Minister Behgjet Pacolli, Deputy Prime Minister Enver Hoxhaj and Minister of Economic Development Valdrin Lluka. 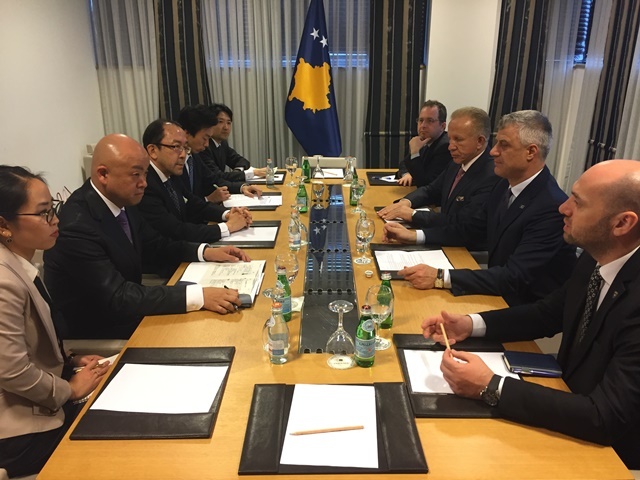 Ambassador Koinuma and his meeting partners confirmed that the relations between Japan and Kosovo are growing steadily. After Pristina, Ambassador Koinuma made a short trip to Prizren. On March 9, 2017, Ambassador Kiyoshi Koinuma paid an official visit to Kosovo's capital Pristina. 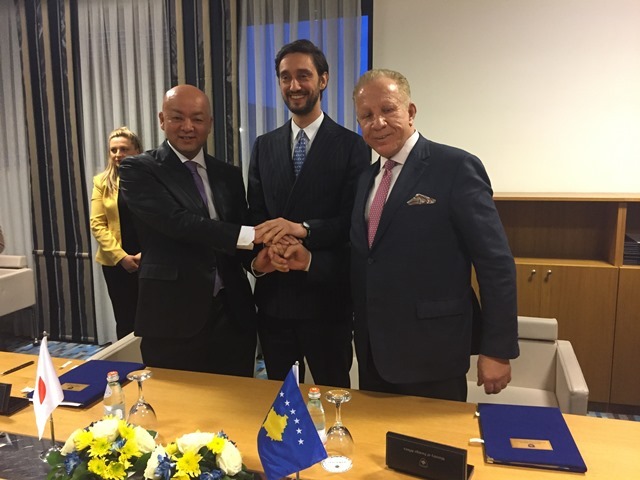 As part of his official agenda, Ambassador Koinuma hosted a signing ceremony for five Japan's "Grant Assistance for Grassroots Human Security Projects (GGP)" that are to be implemented in Kosovo. On the following day, he visited the Hirano Mushroom Plant in Mitrovica where the famous and popular Japanese Shiitake mushrooms are farmed. On the occasion of the Promotional Concert with the Kosovo Philharmonic Orchestra to commemorate the donation of musical instruments by the Government of Japan, Ambassador Taketoshi once again expressed his gratitude to the Orchestra for having showed its solidarity with Japan by holding a memorial concert three months after the East Japan Great Earthquake in 2011. In his message of greeting which was delivered by Mr. Hideo Suzuki, Deputy Chief of Mission, Ambassador stated, inter alia, "I do hope that these instruments will provide the people of Kosovo with encouragement and joy of life that you gave us during our most difficult time. The music that the Kosovo Philharmonic Orchestra performs will be playing an essential role in creating harmony in the lives of the people of Kosovo, in the country which has experienced ethnic conflicts in its past period. The Government of Japan is fully committed to continuing its support for Kosovo believing that the prosperity and stability of Kosovo is vital for the bright future of the entire West Balkan region." He also appreciated the work of the Principal Conductor of the Orchestra, Mr. Toshio Yanagisawa, who makes an important contribution to "the prosperity and reconciliation among multiethnic people through music". Mr. Ryu Shionoya, member of the House of Representative and President of the Japan-Kosovo Parliamentary Friendship Association was in Kosovo. 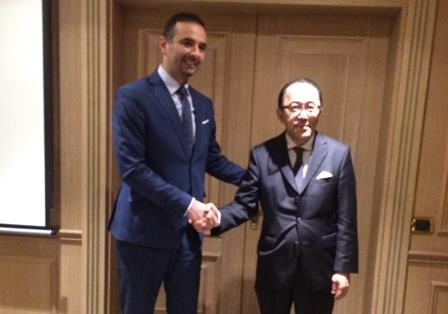 During his stay in Kosovo, Mr. Shionoya met H.E. Ms. Atifete Jahjaga, President of the Republic of Kosovo as well as H.E. Mr. Enver Hoxhaj, Minister of Foreign Affairs and H.E. Prof. Dr. Ramë Buja, Minister of Education, Science and Technology of the Republic of Kosovo. H.E. Mr. Hashim Thaci, Prime Minister of the Republic of Kosovo was in Japan. Prime Minister Shinzo Abe held a summit meeting with Prime Minister Thaci on 14 April 2014. Following the meeting, the two leaders signed a Joint Statement . About 100 pieces of music instruments were handed over by Ambassador Taketoshi to the Kosovo Philharmonic Orchestra on 19 March. 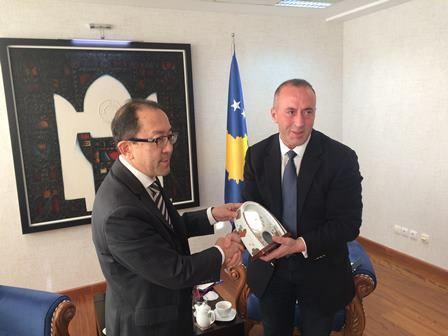 During his stay in Kosovo from 18 to 20 March, Ambassador Taketoshi had meetings with H.E. Ms. Atifete Jahjaga, President of the Republic of Kosovo, among others. He also signed 4 grant contracts for "Grassroots Human Security Projects (GGPs)". 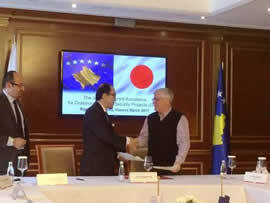 Mr. Makoto Taketoshi, Ambassador of Japan to Kosovo, presented his credentials to H.E. Ms. Atifete Jahjaga, President of the Republic of Kosovo on 21 October 2013. The President and the Ambassador exchanged views on perspectives for Japan-Kosovo relations. The Ambassador delivered best wishes on behalf of H.M. the Emperor of Japan. During his stay in Kosovo, Ambassador Taketoshi also met H.E. Mr. Hashim Thaci, Prime Minister as well as H.E. Mr. Enver Hoxhaj, Minister of Foreign Affairs of the Republic of Kosovo. Mr. Shigeo Iwatani, Ambassador of Japan to Kosovo has completed his mission and left for home on Saturday, August 10, 2013. 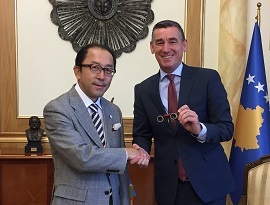 During his tenure as the chief of the diplomatic mission in Vienna, he has been committed to strengthening the bilateral ties between Japan and Kosovo and promoted a wide range of activities from cultural exchanges to development assistance projects. On his last visit in Kosovo on July 16, 2013, Ambassador Iwatani paid a courtesy call on H.E. Ms. Atifete Jahjaga, President of the Republic of Kosovo, and expressed his hope that the recovery of the European economy will bring heightened attention from the Japanese businessmen to the region. The Stone for Peace Association of Hiroshima presented the Stone for Peace, a symbol of a determined desire for peace, to Kosovo. H.E. Ms. Atifete Jahjaga, President of the Republic of Kosovo, Mr. Shigeo Iwatani, Japanese Ambassador to Kosovo, representatives of the Stone for Peace Association of Hiroshima, among others, attended the ceremony, which took place in Prishtina as a kickoff event of Kosovo's "Week of Tolerance and Reconciliation". Mr. Kazuyuki Hamada, Parliamentary Vice-Minister for Foreign Affairs of Japan was in Kosovo. He attended the "End of Supervised Independence" symposium and delivered a speech , held bilateral meetings with H.E. Ms. Atifete Jahjaga, President of the Republic of Kosovo, among others. He also met H.E. Mr. Enver Hoxhaj, Minister of Foreign Affairs of the Republic of Kosovo, and signed and exchanged official notes for granting musical instrument to the Kosovo Philharmonic Orchestra under the "Cultural Grant Assistance*" scheme. * Cultural Grant Assistance is meant to deepen mutual understanding, friendship and goodwill between Japan and other countries, by providing those countries with support for their efforts. This grant assistance was established in 1975 as part of Official Development Assistance (ODA). H.E. Mr. Hashim Thaci, Prime Minister of the Republic of Kosovo was visiting Japan. He held a summit meeting with Mr. Yoshihiko Noda, Prime Minister of Japan, on 8 June.